I haven’t been a Seiko guy in the past, but they have been growing on me over the past year. I decided that I would enter the world of Seiko by purchasing one of the SPB001J1 automatics from the Premier line. I actually ended up purchasing two of these watches and gave one to my father-in-law for Father’s day. 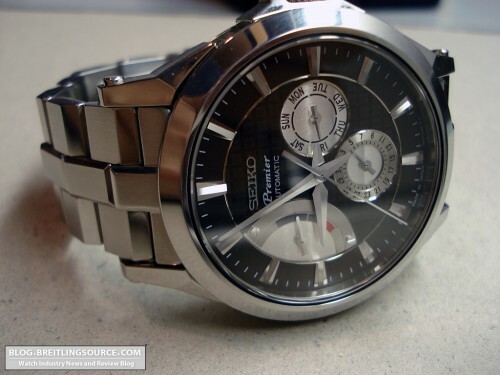 The watch features a very nicely crafted 42mm stainless steel case. The bracelet is also very nicely made and has faceted edges on it, creating a very unique look. Crown is push-down, dial has a nice pattern to it, but no lume at all. The lugs are also faceted on the case and have fake screws on the sides to simulate a slightly industrial look to it. The side of the case has ribs on it, giving the watch an additional level of detail and sophistication. 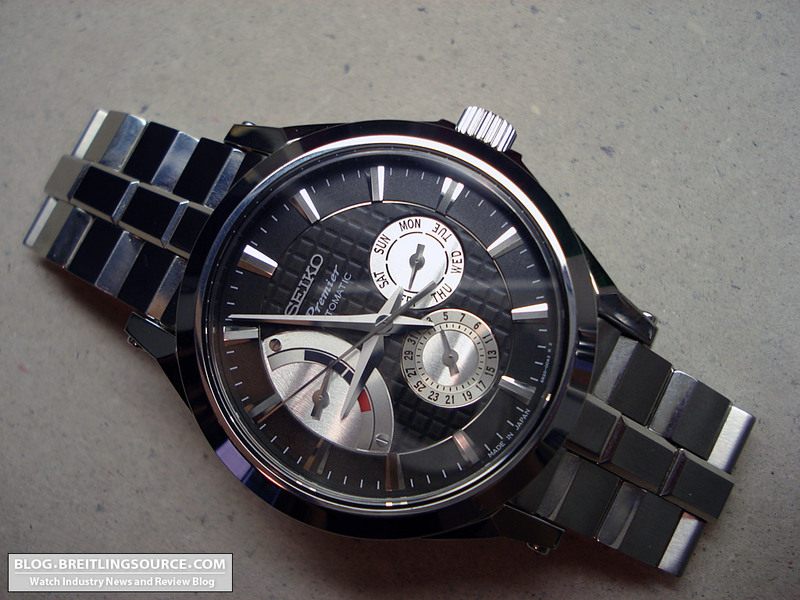 Given the modest cost of this Seiko Premier, it is a fantastic value. 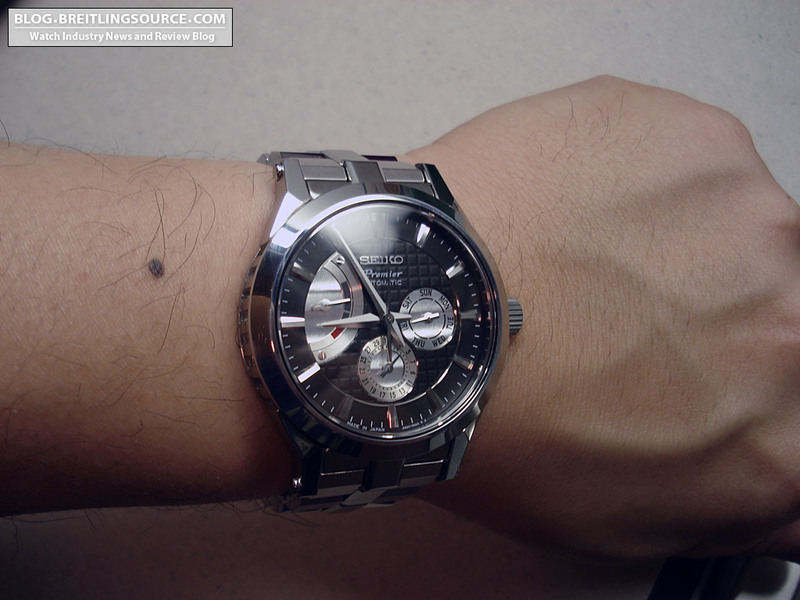 The watch features Seiko in-house 6R20 movement, which, were it any other brand with an in-house movement, would be substantially more expensive. Street price on these watches is around $650 which would be unheard of if it were a Swiss made watch with an in-house movement. These watches are made in Japan, and the complications on this movement are Power Reserve indicator, day, date and time. There is an exhibiition caseback showcasing the Seiko movement. While on the basic side in terms of movement finishing, it is still nice to see it. Unfortunately I did not take a photo of the back, but I did get a closer-up shot of the dial, showing the detail. 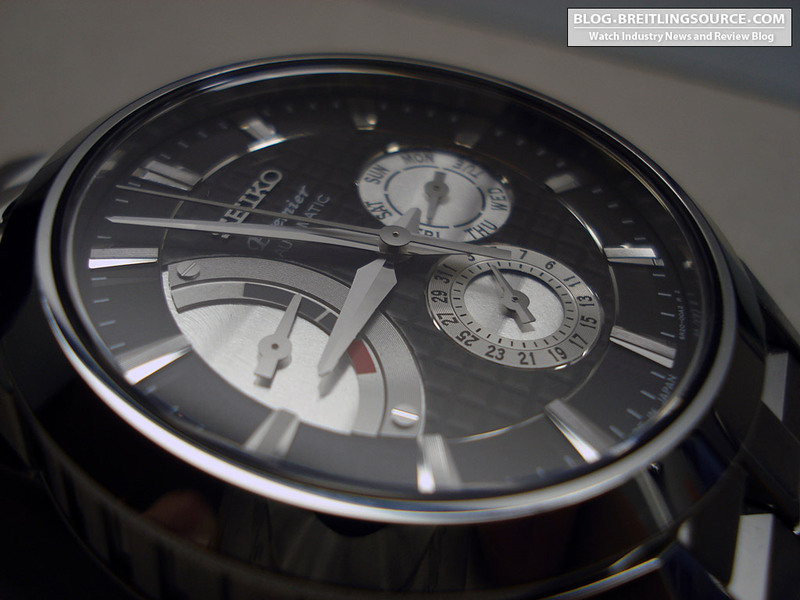 The Seiko logo is applied, which is nice, and while the detail and finish are okay on the dial, they are not outstanding. The dial is very nice, but I feel like some of the Swiss watches of a similar pricepoint have a slightly better execution. The finish on the the surfaces of the dial is a machine finish, and somehow doesn’t work for me 100%. And finally the wrist shot. The 42mm dial suits my wrists very well I think, and also looks very good on on my 6.75″ wrists and also looks great on my father-in-law’s 8″ wrists as well. 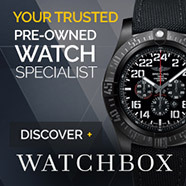 Overall, a great alternative for someone looking for a $1000 MRSP watch, who is tired of the usual Swiss fare. Pros include an in-house movement with proven Seiko reliability and great size and casework. I would recommend this watch and continue to be happy with my own purchase. I have bought this masterpiece in July 2011 and it is still perfectly running after five years. People offered me RM8000 (approximately USD2000 ) to purchase this masterpiece from me..but I am still keeping it because it took me five years to search for this masterpiece when it was first launched in 2006. The secondhand tells us the quality of the watch..superb smooth movement..i guess this is what 6R20 is all about with 28,800 beats per hour with 29 jewels..
As for me, SPB001J1 is much better than my Tag 2000 series, an old Tissot, 25 jewels Swiss Made Blansacar. My friend even commented on the movement and case built on my SPB001J1 is even better than his Omega Seamaster purchased in 2016 in terms of movement. Beauty! If I could get $2000USD for mine I would be laughing all the way to the bank!! !